Get a gift card instead! Email it directly or download for off-line giving. Immerse yourself in a decadent blend of mint and hints of cocoa while your skin is transformed. A mint enzyme softens and smooths your skin while our fresh mixed cocoa mask nourishes and hydrates. Melt away stress with an infusion of cocoa and nourishing oils. Experience soft and hydrated skin with an invigorating sugar scrub followed with a mint cocoa mousse massage. 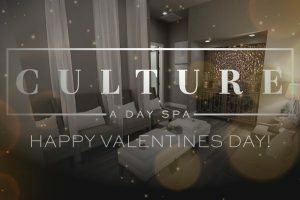 Together with your partner, celebrate this Valentine’s by melting away stress with in our luxurious couples rooms with a side by side Double Chocolate Exfoliating Massage. After your massage experience our private oversized walk in hydrotherapy shower for two. For the finale, dine in luxury in our private dining room featuring a crystal chandelier, white lines, chocolate covered strawberries and a complementary German Chocolate sipping liquor.